The Unltimate Homaking Bundle 2018 IS BACK! For a little while. I love that word. It sounds warm and welcoming, a safe place where I can be with the people who matter most to me. That’s why I put so much effort into making sure my home feels, well, homey and inviting and beautiful. Of course, it doesn’t always. But if it’s a place where friends and family can come through the door and feel comfortable and loved, that’s good enough for me! But if I’m being honest, I haven’t always felt good about the state of my home. The biggest win I’ve experienced in the never-ending stuff battle has been to massively cut down on clutter. This was the game-changer. In fact, you probably already know this. Decluttering is all over the internet! But that doesn’t make it easy to actually do it, right? Maybe you tried decluttering on your own already, but for some reason, it didn’t work? Do you dread the thought of sorting through everything, or not knowing where to start? Does clutter just keep appearing in your home and you don’t know how to stop it? If you relate to any of those questions (and I know I did!) then I’m really excited to tell you about the Clutter: Sorted eCourse. It’s a 20 week, step-by-step eCourse to help you declutter your house (and keep it that way!). The idea is that you can take it slow and make it fit with your schedule, or if you’re making good progress, then just speed it up and finish faster. You’ll get full access to the must-do tasks you need to ensure success, a detailed 20-week plan (including checklists and emails to keep you on track), and lots of help with making sure things stay decluttered for the long term, plus a Facebook group for accountability and motivation! 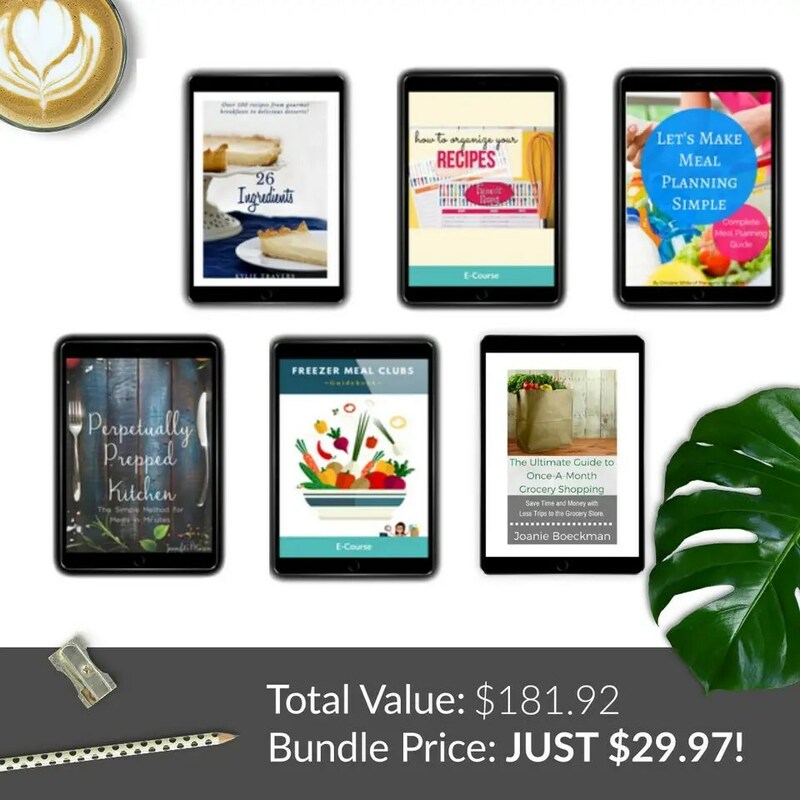 That discount would be amazing by itself, but when you get it as part of the bundle, you’ll also get 128 other homemaking resources, along with the decluttering eCourse. All of these are part of the Ultimate Homemaking Bundle, a collection of eCourses, eBooks, printables, workbooks, membership sites, and more! Now, I get that it’s a HUGE number of resources, but here’s the thing… even if just a handful of products apply to your life right now, it’s well worth the investment. For example, the meal planning bundle above is worth $181.92. That’s 6 times more than the price of the bundle itself! And the best part is this collection is yours to keep. It isn’t going anywhere. So whenever you decide to focus on a new area (a work-at-home business, educating your kids, meal planning, a new printable planner, outfit ideas to freshen up your closet, etc.) you’ve got resources ready and waiting. Everything in the bundle can be yours, but only if you buy it before this collection disappears for good at midnight! But don’t wait too long. It’s only on sale until midnight tonight! This post contains affiliate links please see full disclosure here.